The National Association of Manufacturers (NAM) has just released its Q2-2016 Manufacturers' Outlook Survey, revealing an optimistic outlook. More than half (61.7 percent) of manufacturers feel positive about their company's outlook, up from 56.6 percent who said the same thing in March. Among their concerns moving forward, 75 percent of manufacturers consider regulatory burdens as primary hurdles--82.6 percent say that their company's total spending on regulatory compliance had increased either modestly or substantially. Also noted as changes needed to make their businesses more competitive: lowering the corporate tax rate to 25 percent or less; making permanent an enhanced research and development incentive; and enacting robust capital cost-recovery provisions. The 3D Metal Printing Experience and Tech Tour, scheduled for August 18-19, in Livonia, MI, will give you the chance to interact directly with industry experts, learn about the latest technology developments for 3D metal printing and witness 3D metal printing in action. 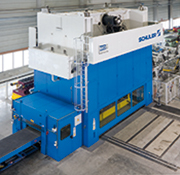 This unique event also features exclusive plant tours, so you can engage with company representatives and view 3D metal-printing machines in action; and a roundtable discussion led by industry expert and technical consultant Todd Grimm. For the program agenda, hotel details and online registration, view the event webpage. The newly published report, U.S. Industrial Outlook: Shaking off the Shocks, from the Manufacturers Alliance for Productivity and Innovation (MAPI), predicts 2.5-percent growth for U.S. manufacturing in 2017, followed by a 2.8-percent uptick in 2018. This on the heels of a fairly stagnant 2016 (0.4-percent forecasted growth) caused by "shocks" such as the collapse of oil prices, the strong dollar and an exceptionally high inventory-to-sales ratio. What will fuel the coming rebound? New housing starts, continually rising motor-vehicle sales, and strong growth in the production of medical equipment and supplies are among key enablers. Regarding specifically the market for fabricated metal products, MAPI forecasts a 1-percent uptick in 2017 (following a 2-percent slide in 2016), and 2-percent growth in 2018. The recently released 2016 KPMG International Global Manufacturing Outlook finds that 74 percent of manufacturing-company CEOs report growth as a high priority during the next 2 yr., with more than half categorizing their growth strategies as "aggressive." According to KPMG executive Doug Gates: "There are fierce competitions being fought over every rap of market share available and we will certainly see winners and losers. Maintaining the status quo will not drive growth." Among the weapons planned to fight these fierce battles for market share, as noted in an article summarizing the report's findings: significant increases in R & D investment, and growing use of robotics and digital technology. 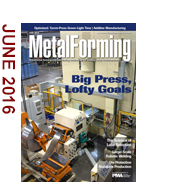 Where do You Read MetalForming magazine? Tell (or Show) Us and Win! We are looking for women in leadership positions or on the shop floor, those who represent dedication to their company and the industry, and demonstrate excellence in meeting their workplace responsibilities. And we need your help. MetalForming magazine is seeking nominations for its new Women of Excellence in Metalforming section, to run in the November issue. The section will feature and honor those selected as a means to recognize and promote the importance of women in the metalforming and fabricating industries. Nominees should be employed by a manufacturer of metal parts and components or a supplier to the industry. Click here to place your nomination.